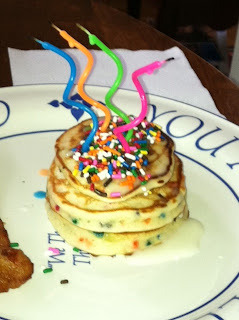 So... my youngest daughter had a birthday recently, and her request for a special breakfast was for me to make Cake Batter Pancakes. We had seen the recipe (and compelling photos!) on a fun blog called "How Sweet It Is." Those sprinkles were just too much to resist, especially for such a special occasion! Everybody was really pleased with the final results! (...especially the birthday girl!) Definite cake batter flavor, but the actual pancakes were not overly sweet. LOVED the glaze, but it would probably also be good with whipped cream topping. For some extra-special birthday fun, we stuck in a few candles and sang the birthday song to the birthday girl! Here is the MOST IMPORTANT thing about making Cake Batter Pancakes, no matter what day you make them: Whatever you do, DO NOT EVER, under ANY circumstances, omit the sprinkles!!! Ice cream! I wish I had thought of that! You could definitely taste the cake batter flavor, but not overwhelmingly. The texture was still very much like regular pancakes, though.